Continue on to see the patch notes. - Fewer hard choppers, dribblers and popups in online and local two-player games. - Logic adjustments to increase the urgency of fielding in the infield. Specifically for DP situations and when faster runners are batting. - Adjustment to correct the fair/foul ball detection on hits in close proximity to foul poles in multiple stadiums. - Update to Coors Field jumbotron. - Various bug fixes and adjustments made throughout the game. I didn't know it was possible to make something like a change to the Coors Field jumbotron via a patch, but I am damn happy they managed it! 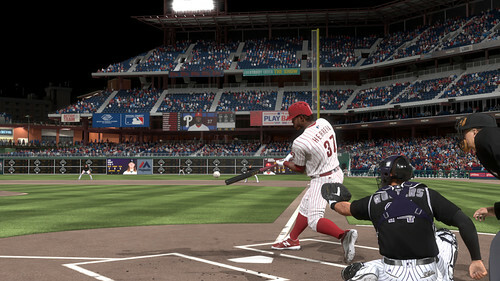 My Rockies franchise just got an extra boost from being able to look at that giant beautiful scoreboard every at-bat. Especially after getting to see that gigantic scoreboard in person two weeks ago. I don't always pay close attention to what gets fixed via a patch but I know they've fixed uniforms in the past (Tigers) and wall/HR detection (can't think of the right way to say it at Wrigley before. Cool to see this fix for sure though. Yeah, it surprised the hell out of me. I had been hearing that something as big of a change as a scoreboard or something large in the stadium other than the wall detection you mentioned, was something that couldn't be updated via patch, that it wouldn't be possible until next year's game. I had already resigned myself to not seeing the mega scoreboard until next March. Then they suddenly manage to put it in the game via patch. So I'm damn happy with this patch. I got to see that gigantic scoreboard in person when I was in Denver May 4th-9th. The event I flew out there for was on Saturday and others flew home Sunday, but I stayed intentionally through Wednesday for the sole reason of going to the Angels-Rockies game on Tuesday, May 8th. That thing is beautiful in person. And now I get to look at it every time I bat at home at Coors Field in The Show.